Today a look back at a long-time, if quiet, favorite. This isn’t a book that shows up on my favorite lists usually, but it stuck with me more than most…and it’s my go-to when discussing whether deep and complex subjects can be appropriately portrayed in children’s stories! It’s funny the books that stay with you. I remember around about third grade (maybe, I don’t remember that part for sure) we had to do a certain number of book reports during the school year, maybe per month. I don’t remember if I found that challenging, but I doubt it. 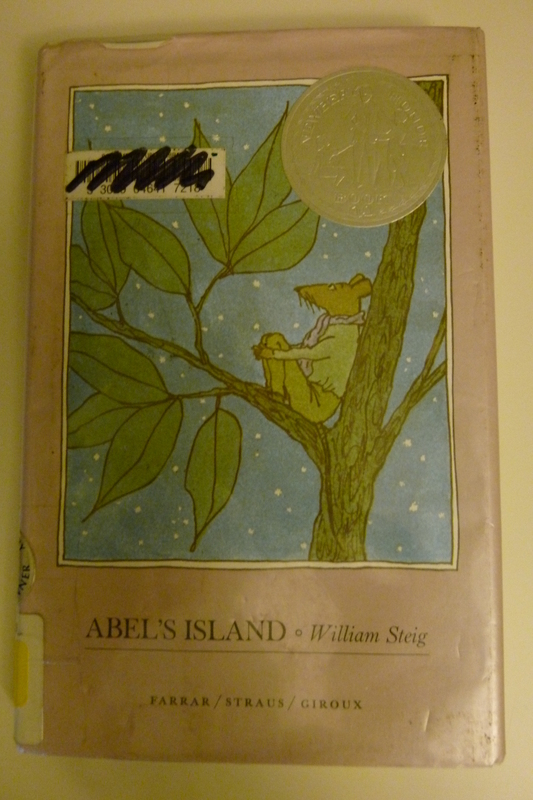 🙂 I also don’t remember any of the books I did for this, except one: Abel’s Island by William Steig. For whatever reason, that one stuck. Although I don’t think it was until I reread it recently that I made the connection–William Steig! The one who did a bunch of picture books! You know, Doctor De Soto and Sylvester and the Magic Pebble (and he also has the happy good fortune of being alphabetically near James Stevenson, my favorite picture book author). Yet another advantage of revisiting childhood favorites. By all means check out the picture books, but for now, back to Abel’s Island. Abel is a mouse, who lives in a fairly modern society with other mice. They have clothes and towns and jobs–although Abel doesn’t have a job himself, because his mother has money. Abel and his wife Amanda go out for a picnic in the woods one day. When a storm comes up, Abel is literally blown away. He’s carried down a stream and ends up on a small island in the middle of the river. And there he stays, unable to signal help or to build a craft which will survive the river’s current and carry him to the opposite shore. Abel has to figure out how to survive on the island, taking care of his physical needs and, even more so, struggling to deal with his intellectual and social needs. I suppose it’s a bit of a Robinson Crusoe story, but much shorter and more interesting! I’m trying to remember what I liked best about the book when I was a kid, and it may have been the survival aspect. Now, it’s Abel’s internal growth. His time on the island strips away all the clutter and the defenses that society normally gives us, and forces him to really look at himself in raw honesty. He realizes how pointless his life has been, struggles with how he’s been living, and ultimately comes to a new realization about his calling. Pretty deep stuff for a kids book, right? 😉 It’s handled fairly lightly, but the themes really are deep and universal. Yet another example that makes me want to throw things when people say, “oh well, I didn’t expect much depth from it–it’s a kids book.” A talking mouse can have an existential crisis too, and do it in a way that will make it a perfectly appropriate book for a third-grader. I won’t swear that Abel’s Island is really vastly better than all those other books I read that I can’t remember anymore. But it’s definitely a good one, and one worth remembering. Blog Hop: …And We’re Off!